Home » Website Building » Weebly » How to Backup Your Weebly Site? Site backup is one of the most important tasks of webmasters, which will really help in emergency situation. Especially with a free site builders like Weebly it is essential to backup a site since there is even a possibility of the site being deleted due to violation in terms of services (this is applicable for both free and premium users). Login to your Weebly account and edit the site you want to backup. In the site editor navigate to “Settings > General” section. Enter your email id under “Archive” section and click on “Email Archive” button. Backup of your Weebly site will be sent to the email address as a .zip file. Last three backups are shown under “Recent Exports” which you can download by clicking on the corresponding link. Every site owner should keep backup of the site to restore it in an emergency situation. Backup is also important for migrating to other platforms and to avoid the fear of content loss. Unfortunately Weebly does not offer complete backup solution and site owners should aware of this fact to avoid unforeseen scenario after building a large site with Weebly. Below are some of the problems associated with Weebly backup. Backed up .zip file can’t be uploaded back into another Weebly site, which defeats the very purpose of backup. If you have a problem with current version of your site then the only way is to copy paste the content from your backup which is really time consuming if the site is larger in size. Blog posts can’t be backed up. This is the reason why people should be away from Weebly blog; later migrating to another platform will become a real issue. Any unindented deletion of blog posts will result in irreversible content loss. Site backup will have all images, which are not part of the published site. For example, if you have uploaded an image “example.png” and resized it to fit to your layout then Weebly stores two images – one is your original image and the other is with the modified size. Though the original image is not the one displayed on published site it will be still available with the backed up content. If you want to migrate your Weebly site to any other platform then you first need to cleanup the “uploads” folder in the backup under which all images are stored. This is not an easy task when you have thousands of images. Tal.ki forum created with Weebly “Forums” element will not get archived along with your site content. So away from Weebly for creating a forum site. I would like to backup my email to a separate location on my computer. How can I do this? You can’t archive emails like Outlook PST files on most of the email services. Not being able to back up my weebly site is a total ripoff! I spend real money by upgrading to the business level and can’t be protected. This is unethical!!! If Weebly can’t protect its paying customers, they should go out of business. I have an archive listed on my blog at my Weebly website. It shows my posts from the last three years. How can I increase this? I don’t understand the last editorial post. How does it help with Data loss, if it can’t be restored? If it can be used for migration, why can it be used to create a new site? You can’t upload the archive back in Weebly. But you can use the content to create a new site with different platform other than Weebly. I had a website with Weebly but cancelled it due to stopping the business for a while. I do have a backup of the site and am going back into that business. 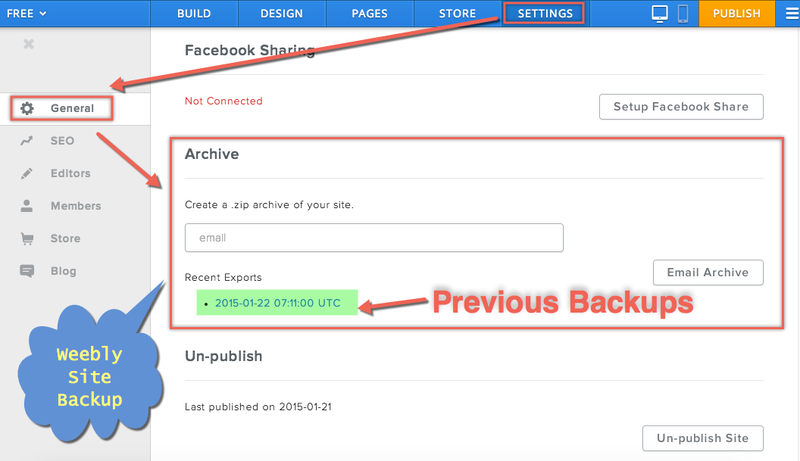 Can I use my saved backup to get my old site back when joining Weebly again? No, you can’t restore the site from the backup. The only way is to copy / paste and recreate again. – if I give access to my website to another email address as administrator and my account gets deleted by weebly, will the site be deleted on the shared account as well? – It used to be possible to make a copy of the site via the old dashboard but i cant find it anymore, did this disappear as well? Your site will be deleted everywhere as other admin can only see the site which is still under your account (it is not hosted in two different places with the same domain). Yes, it is possible to make a copy from the dashboard. However, you can’t copy blog/product pages. I have the paid store and just realized I cannot backup my products. Will probably find a new service because this is a crazy oversight. We run multiple sites on Weebly for past many years and did not realize the need of backup any time. But when things are messed up (either by Weebly or you or client or admins) you definitely need a backup to restore the site quickly. It is also questionable and surprising to have a site without backup features even for an eCommerce plan of $25 per month (current rate). I’m trying to use the free Weebly builder and am looking for the Archive under General in Settings. It doesn’t exist for me. Sounds like it’s pretty useless anyway, but am I missing something, or is this really not an option for the free version (even though it says it is)? Archive option should appear for all Weebly users including free users. If it is really not appearing on your site then submit a ticket to Weebly and get it clarified. This is unbelievable. I just started building a large blog on Weebly Pro with more than 500 posts. Now I find that there is no way to back up the site (as a backup, not a text dump)? How can any developer use this platform for building customer websites? What happens if they get in, and screw up their site? What I screw up their site? This is the problem with Weebly and most free hosting companies, think of migrating to better platforms at least at this moment. Re: backups: weebly lets you easily make a “copy” of a site, even on free accounts. It’s not a backup that you can store somewhere outside of weebly, but it does mean that I have got an original copy to go back to if something gets screwed up. No doubt its good to have a content backup on your local drive. Unfortunately it’s of no use unless you can use it for restoring if not outside Weebly at least within Weebly. Moreover you can’t backup blog posts even to local drive. One scenario – what would happen if you accidentally deleted the blog page (under “Pages” tab)? Your complete blog posts will be wiped off with no option to get it back from the whole world. I have a big blog created with Weebly, is there a way to backup the entire blog? There is no default way to backup Weebly blog post. If you are planning for migration then use feed readers to extract data of recent 10 posts. Then delete last 10 posts and continue the same. It looks very funny that we can’t restore the backup again to Weebly, then what’s the use of backup? Backup is mainly for data loss & migration, otherwise it can’t be used as it is.